Dr. Wiesner Test and Automation, a 50 year veteran of the industrial automation industry has marked its entry into the B2C lifestyle consumer segment through the launch of SmartWash, a range of automated bathroom closet seats. 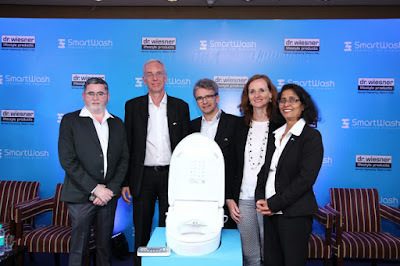 A fusion of precision German engineering and local manufacturing in Bangalore, SmartWash aims to redefine the hygiene, convenience and luxury benchmark in Indian bathrooms. Available in 4 different variants, SmartWash aims to usher in a distinct shift in our day-to-day bathroom experience. With features like automated water cleansing for both men and women, pulse and water massage and odor control, the SmartWash offers a truly global quality offering at prices tailored to suit Indian budgets. The price range begins at Rs 9999 and consumers will have the choice to purchase their product through the online store or through local stores very soon. Post launch, the team is looking to ramp up production capacity at its Dabaspet facility near Bangalore. There is a strong push to adhere to the ‘Make in India’ theme and they estimate the team strength to quadruple in the next two years. SmartWash has received very positive interest from interior designers and real estate developers that promises to be a high volume growth area for the brand. The company has plans to enhance their lifestyle category product line in the near future with products like air purifiers and nebulizers under development.